Sorry I won't be able to attend Voices in the Park in Vancouver on Sept. 15, 2012. The Saturday outdoor concert, held in Brockton Fields at Stanley Park, is a benefit for the Sarah McLachlan School of Music in Vancouver. In addition to Sarah McLachlan, headliners include Bryan Adams, Stevie Nicks, Hedley, Jann Arden, Chin Injeti, The Boom Booms and the Vancouver Men's Chorus. President Bill Clinton is scheduled to appear as a special guest -- although no word if he'll be playing the saxophone! Tickets went on sale in June, and 3,500 of the 20,000 are in a designated reserved seating area in front of the stage. The reserved seats range from $135 - $185 - $285, and the latter includes reserved premium seating. 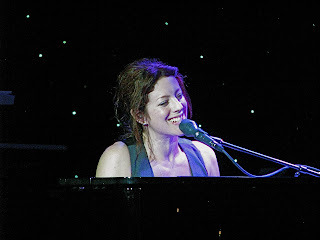 For the VIP Meet + Greet with Sarah McLachlan Package, it will set you back $400, and includes reserved premium seating along with a meet and greet with Sarah before the concert. General Admission tickets are $85. Ticket holders are encouraged to bring blankets for sitting on the grass, as personal chairs are not allowed inside the gates. The gates open at 2 PM and the concert concludes at 11 PM.